A novelty at Sainte Marie-aux-Mines 2011. Very transparent and bright parallel growth with a pink! 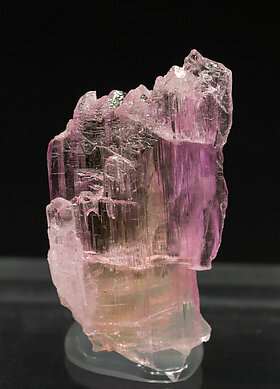 color that appears with special intensity in some areas of the crystal. 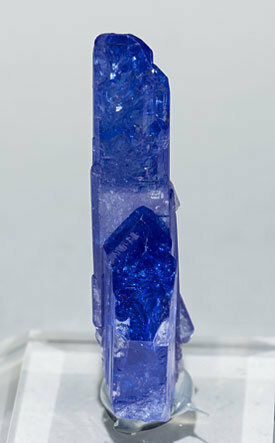 Single crystal with very well defined faces and edges, with very transparent and bright (gem quality) terminal faces and an excellent color, intense blue with violet shades. The transition between the different colored areas on the crystal indicates it has not suffered any heat treatment. 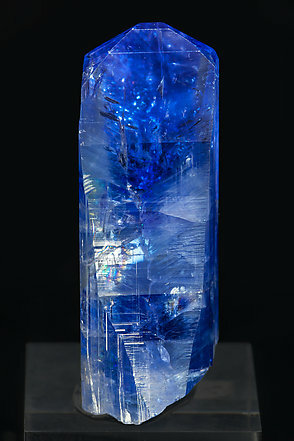 Single crystal, very big for the species, that shows very well marked parallel and laminar polycrystalline growths, with a good termination, an excellent violet-blue color and on a matrix of small laminar hexagonal Graphite crystals. 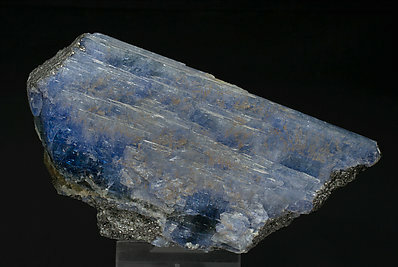 It is partially coated by very small unidentified crystals that fluoresce orange under the UV light. A piece for the collector, not for faceting but very interesting as a mineral sample. 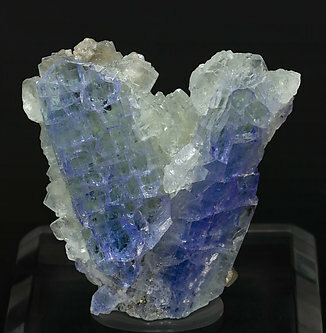 Parallel growth of two Zoisite (tanzanite variety) crystals, one of them very elongated. They are transparent, with a very intense and uniform color and small white Prehnite crystals, whose existence testifies that the sample has not been heated to increase its color intensity. 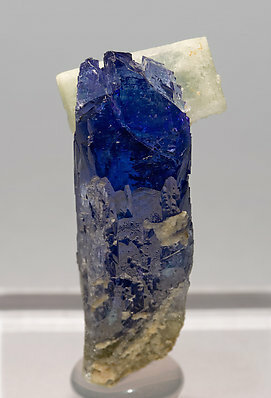 A crystal with very well defined faces and edges, transparent, very bright and with a doubly terminated crystal. The color is especially intense and, due to some details, we believe it is natural, not induced by heating. The "fresh" appearance of related Prehnite crystal, with some white areas that must change color when heated, and the grayish shades at the bottom of the piece, that must also turned to blue-violet, are reasons why we offer this sample as natural, not heated. 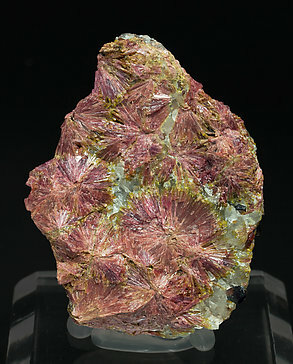 Group of two crystals. One of them, the left one, is doubly terminated, blue with slightly greenish areas. They are transparent, very bright and with crystals of Chabazite and well formed Prehnite crystals completely coating the back side and the top of the Zoisite crystals.